You either have to overlook or forgive the fact that Sam Kelly was once involved with reality TV – I won’t name the show, but it does have an individual named Mr Cowell in charge. Thankfully he survived unscathed and has come up chipper and is certainly wiser for the experience. Now he’s got roots and how! Spokes is 100% proof. It’s the sound of young discovery and experimentation and in all honesty it’s thrilling to hear. Apparently his grandfather used to sing Irish songs about the house, but beyond that he had no real apprenticeship in any shape or form linked to folk. Not that that has stopped him: he’s offered support to Cara Dillon, has superlatives from Mike Harding, is on nodding terms with Seth Lakeman and membership of the morphing West Country folk umbrella Changing Room. 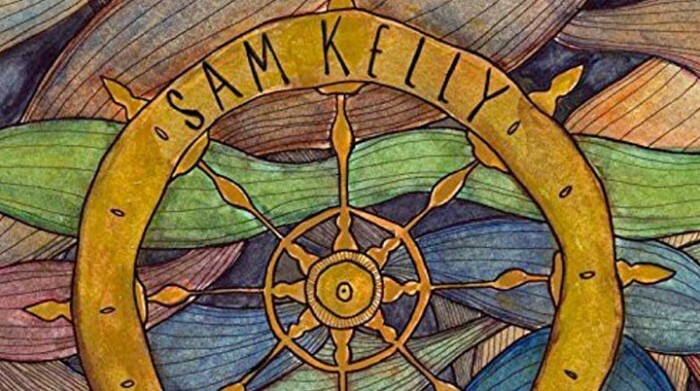 No, Sam Kelly hasn’t let the grass grow under his feet in the slightest. Perhaps inevitably on this his second outing he’s dived in head first and clearly is having a whale of a time finding his own sound. He can be heard recycling trad sources and letting them inform his own compositions as well as those of his band mates Jamie Francis (strings of all kinds) and drummer Evan Carson. Currently he’s playing live with the pair as an acoustic trio whose unplugged samples on the net are intriguing, but Spokes is electric -in more ways than one.